The Muslim Quarter in Xi’an is one of the most well-known parts of the city. Visitors to the city will consider it a whirlwind lesson in bartering and delicious-looking street foods, while those who live here most likely see it as a touristy area worth staying clear of during national holidays. But there’s more to the Muslim Quarter than the wafting scents of cooking and frantic efforts to offload souvenirs; tourists and residents alike would do well to look beyond the touristy façade and dive into the real heart of Huimin Jie (回民街). Start your tour just west of Zhong Lou (the Bell Tower) at the Drum Tower. Tickets are available to go inside, but our tour starts behind the towering building on Beiyuanmen (北院门). If this is your first time to the Muslim Quarter, take a leisurely stroll down this road. Buy some pomegranate juice or lamb on a stick, but be aware of your things. As mentioned above, this area, especially the main street, is primarily filled with tourists and therefore attracts its fair share of pickpockets. Further down the main road on the left (with your back to the Drum Tower) is a place where you can see a shadow puppet show in the evening. So when it starts to get dark, just find the appropriate booth and sign up. As for food suggestions along the main street, try and grab some samples of the ginger candy and pounded snacks along the sides. If you’re lucky, the workers may let you have a go at hitting the batter. If you are a fan of fruit leather, you will find a delicious variety among the stands. 15 RMB will buy you a large roll. A personal favorite is a restaurant that specializes in hulatang (a thick soup served with bread) and peanut flavored liangpi (cold noodles). It will be on your left a little after you pass Xiyang Shi, the road under the archway. You’ll be able to see both the liangpi and hulatang stands outside on either side of the door. There are two entry points onto the main bartering street. The first is just behind the Drum Tower at the start of the Muslim Quarter and the second is through the archway on your left (down Xiyang Shi) followed by the first left down the alley of shops. Following option one, you will come upon a newly opened coffee shop called Café de la Tour. Their menu isn’t extensive, but if you want to enjoy a cup of coffee, it’s a nice break from the hustle and bustle outside. For only 15 RMB you can enter the Giant Mosque, which, from the outside, looks deceivingly small. You’ll find the gate entrance along the bartering street but bear in mind that this is a fully functioning mosque. As such, it’s important to be respectful and to follow the rules of etiquette (e.g. take off your hat and shoes, avoid making loud noises, dress appropriately etc). Don’t be surprised to see scores of locals flooding in and out, especially during prayer times. If you continue along Xiyang Shi and don’t turn up towards the bartering street, you will walk through a progression of storefronts and restaurants. This is the place to try biang biang, a Xi’an specialty noodle. The dish was originally a cheap meal, but it has become famous due to the Chinese character’s complexity. The character for biang has an impressive 58 strokes. Most restaurants serving the dish will have the character posted outside their store (pictured below). If you venture down this road early in the morning you will see long lines coming from a small shop on the corner where Xiyang Shi and Bei Guangjijie intersect. The store specializes in salted meat that is highly recommended. From this point on there are a variety of different streets, each home to a specific specialty. These markets are usually open before noon on both Thursday and Sunday mornings. If you pass Beiguangji Jie (北广济街) and proceed down Xiyang Shi a bit further, you will eventually come upon the vegetable and fruit markets. These markets are all day, everyday affairs, but things are livelier in the mornings. Hang a right on Xicang Nanxiang (西仓南乡) to follow the stands of vegetables down the road. You will soon hit a T in the road. If you venture left and follow the sounds of birds and large crowds, you will eventually find yourself at Xi’an’s bird and flower market. The bird market has a huge assortment of species and if you don’t like bugs you may want to keep this street off your list of things to-do as you will see many people buying larvae and grasshoppers by the bag. You’ll also find a large area specializing in the sale of goldfish and turtles nearby. Aside from just buying grasshoppers for birdfeed, you may also catch a chance to see a live cricket fight. Gather around as people take their bets on the victor, then watch the little bugs duke it out. It may seem a little old fashioned, but it’s an interesting experience and can get quite animated. 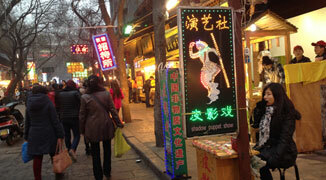 Xi’an’s Muslim Quarter is a gold mine of shops, restaurants and experiences. The area is well worth exploring, if not for all the sights, scents and noises, then for the intriguing window into Chinese culture it offers.